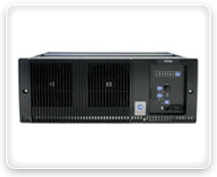 The TB9100 P25 base station/repeater offers reliable continuous duty cycle operation at a range of temperatures and altitudes. Flexible, modular design combined with intuitive programming software make the TB9100 an ideal P25 solution for conventional, trunked and simulcast mission critical networks. In addition, the TB9100 transportable repeater is ideal for use in emergency situations such as accidents or natural disasters, and for tactical operations everywhere from remote or inaccessible locations to densely built-up urban environments. It is available in 50 and 100W configurations in a range of popular frequency bands. Fully P25-compliant, the TB9100 can be configured as a base station/repeater in a digital P25, analog FM or mixed-mode radio network. Routines and code can be written quickly and easily allowing fast development and delivery of value-adding custom applications. Change over 150 parameters with intuitive drop downs, tick boxes and other easy-to-master software commands. Tait's Customer Service Software makes the TB9100 easy to configure and upgrade. No special equipment will be needed to ensure total control of your base station/repeater. Connect and configure alerts and alarms, monitor performance and administer the site remotely. Network your TB9100s using VoIP with built-in distributed or centralized voting. Utilizing the same reliable software-based platform that has made the TB9100 an industry leader, the lightweight analog and P25 digital transportable repeaters are packaged in ruggedized cases. The transportable repeater includes a lightning arrester and the pelican case is available in multiple colors to suit the application.